In January we committed ourselves to a return to Paris, to spend a summer there, and for months looked forward to it, wondering what new we would discover. Lots, as it turned out. What became our fifth stay in old Belleville had lots of tasty novelties for us. The greatest perhaps was the new perspectives that biking around the city gave. We'd booked the Berlin-Paris train the same day that we had decided on our bike route and the storage of our things in Berlin. At that time it was only Gerry's hope that we'd take our bikes with us on the train to Paris, as we hadn't been able to figure out on the web if it was possible or how to make reservations. But at the Eisenach Deutschebahn Station a very kind clerk had patiently helped us and sold us places for our bikes, which miraculously turned out to be in the same car as our reserved seats. 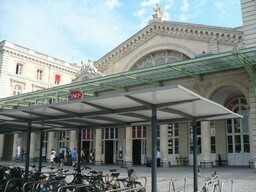 We got to Paris July 5, at 9:30 in the morning, arriving at the Gare de l'Est, well known to Gerry from his days living in France; then he passed through it at least once a month and sometimes as much as twice a week. The same student who helped us on the train in Berlin helped us get our mountain of luggage to the front of the station. We left the bikes parked and locked in the bike parking area and took a taxi to Veronica's. 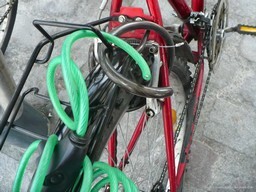 After a good chat with her and a bit of a nap we went back at 3pm, only to find both bike-lock cables cut. Topping this surprise, only Gerry's bike was gone! Jan's sat there unchained, almost lonely, available for anybody to take. Apparently Gerry's, with its disk brakes and double suspension, must have been a boy's and thief's dream while Jan's newer but simpler bike wasn't attractive to the thieves. Dashed for a moment were our dreams of biking all around Paris! Greatly annoyed, we immediately set out to look for a replacement bike for Gerry and turned to Craigslist. There, after two weeks of looking (and turning down one bike) Gerry found a substitute. It didn't have the disk breaks and shock absorbers he wanted but he took it anyway and is pretty happy with it as the gears work fine and it is very light; so light that Jan is jealous of it. We arrived just past the longest day of the year and loved the long Paris evenings. In our first few days in town Paris presented us with the tail end of a heat wave. After so much unexpected cold (and rain) in Germany it was rather a shock to wish for aircon. We gradually got used to the heat and learned how to leave the windows open at night so that the flat would cool and we could sleep. And it wasn't New-York hot every day; no, just for 3-5 days and then there would be a week of comfortable weather and then again more heat. As July went, then August ended and September came, heat and light went away on tip-toes; so gradually at first that it wasn't noticed and then we got to where we needed the lights on to make breakfast and dinner and couldn't go about in shorts any more. Bare feet were replaced by slipper-ed ones. While waiting for a second bike we turned to walking and made some nice walks starting and ending at the apartment. A nice change for our muscles, which had been tightened to the point of sometimes cramping by our steady biking. We walked out to Pantin on the northeast and thereby began to learn about the near suburbs of Paris; similarly we went by foot all around the 20th arrondisement and to Bagnolet, site of the closest hypermarche. Other than that in our early days we mostly enjoyed home, TV, and getting to know French cooking again. Ah! Bread and Cheese! When we had bikes again our horizons really expanded. 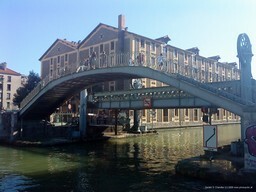 Our first outing was meant to be to the Air and Space Museum in Le Bourget but we got sidetracked on the way there when we crossed the Ourcq Canal. 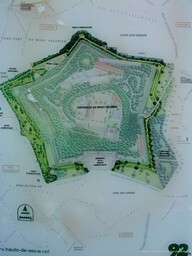 It is still in use for carrying freight but has a recently added jogging and bike trail along its side. Before we knew it we were well outside Paris and having a picnic lunch. Coming back tired us, not really having done so much biking for weeks. 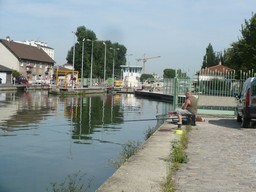 Not much after that we discovered another canal path, this to St Denis, along the St Denis Canal. Since then we've been along each of these canals numerous times and gotten to know most bends well enough that we know what is around the corner. 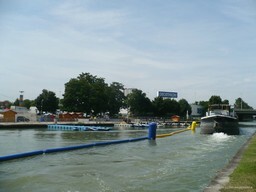 We really enjoy the quiet and water; especially compared to the noiser and more dangerous streets. Every trip to Paris is different. Being here through the summer meant that intellectual Paris was nearly shut down. On the first Sundays in July and August it seemed that half of France was on the autoroute going south; the highways were also crowded, if not so much, on all the other weekends. That means that in Paris there were none of the usual talks that we like to go to and even the Opera and most classical theater was off performing some place else; often at a festival in southern France. We had no trouble filling in. Through late July and early August we explored central Paris like we'd never done before. It was great fun to bicycle along the Grand Boulevards, onto the Blvd Haussmann and past the luxury departments stores to the Arc de Triomphe. 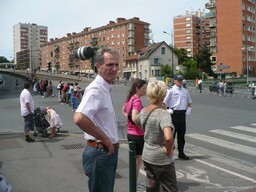 Imagine us, on our bikes, going around l'Etoile surrounded by cars, with nary a care. 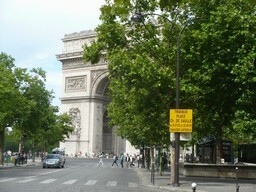 We did that twice, the first coming back along the Champs Elysee, feeling so much more important than mere pedestrians. The second time we went on through the Bois de Boulogne to Mt Valerien, the highest point west of Paris and site of fortresses from Roman times to the last century. 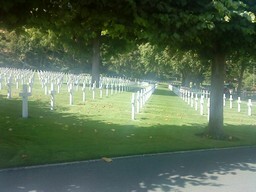 Just below the fort we discovered the Surnes American Cemetery and found the mostly WWI graves impressively cared for; we'd had no idea it was there. At the end of July we celebrated Jan's 60th birthday, the first repeat-celebration for either of us in any city for ten years. Back in 1999, during our first stay, Gerry organized a surprise party for her and loads of family and friends came. This time it was a day just-for-two. A lovely day. We had a great bike ride out to and along the Marne river at Joinville-le-Pont, intending to eat at one of the few remaining Guinguettes (riverside restaurants/wine houses with dance floors; the Impressionists painted plenty of pictures of them). It happened to be the day that the Tour de France, the great bicycle tour, entered Paris. We'd been watching it at home almost everyday for the two weeks it was on, so it was a pleasure to find ourselves accidentally on its inbound route, seeing patches of people on the closed streets where later crowds would build. Fearful that we'd find all the restaurants closed we didn't pause the needed hour to wait for the Peloton. Nonetheless we were too slow and by the time we decided we where we wanted to eat had missed the designated lunch hours (mostly 12-3) of all the restaurants . One, just one, was serving anything and there we got a glass of champagne and a meal of mussels and chips. It was gorgeous weather and it was lovely sitting by the river and enjoying the sunshine for l'anniversaire de Jan. The cloud spoiling the silver lining was that Gerry got a flat! Having spent nine months riding our bikes around Berlin and five weeks on the road in East Germany with not a puncture, we were taken quite by surprise. Riding the last bit to the Guinguette his tire suddenly went flat. We had no spare and no repair kit, so we had to take a train partway home and roll the bike the rest of the way. It didn't matter. We'd had a really fun day. In late August we began conquering castles. 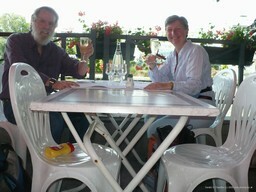 First we rode our bikes 20 km north to the Chateau at Ecouen. 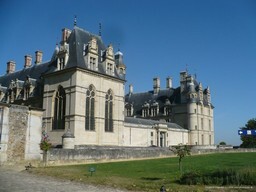 It was originally built in 1538-1555 by Anne de Montmorency; he was the treasurer for Henri II. 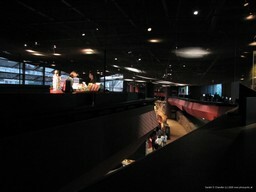 It's an imposing place that now houses the National Museum of the Renaissance and that's why we went there. The collected art work is very impressive and we were reminded of how in Berlin we visited several Schlosses that had been re-used as art museums. 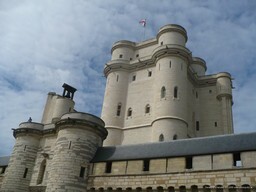 A week later we went to the Chateau de Vincennes. This had been closed for reconstruction most of the last ten years, so we felt lucky to get in. The Donjon was the main residence building (it was the first princely palace to have an indoor toilet for the king) and we had a good guided tour. In the nearby Sainte Chapelle (which was inspired by the much more famous one near Notre Dame de Paris) there was a special exhibit on Bulgarian Icons. We just lucked out as it was the last day of the exhibit. We saw it in the morning without any waiting. In the afternoon the lines were 30 minutes long to see it. Our next castle was that in the Parc de Sceaux. This was built as the home of Colbert, the most important of Louis XIV's ministers. In the Revolution of 1789 it was confiscated and almost all the buildings destroyed; thirty years later, with the monarchy and royalty restored, new buildings were constructed in a very pleasing style called "stone and brick" The chateau and some outer buildings now serve as the county museum and, again like Berlin, house period furniture and paintings. We particularly liked seeing the paintings of all the chateaus in the Paris region; we'd been to most although there were two we'd never heard of. Today the grounds, or Parc, are restored and a wonderful place to walk, picnic (as we did) or jog (as so many others were doing). We got there by a 15 km bike ride; coming home we did a little extra and needed 18 km. In Berlin a trip of this length would be entirely within the city limits. Here it is not, but if President Sarkozy gets his way the official boundaries will be changed to include Parc de Seaux and much more in the official limits of Le Grand Paris. We're a bit ahead of Sarkozy. For our purposes we call anything within a Metro, bus, or bike ride as being in Paris; that includes St Denis, Mt Valerian, Versailles (not visited this year), and Ecouen. Roughly speaking, if its more than 25 km, e.g. Melun, Arras, and Reims, we don't count it as in Paris. 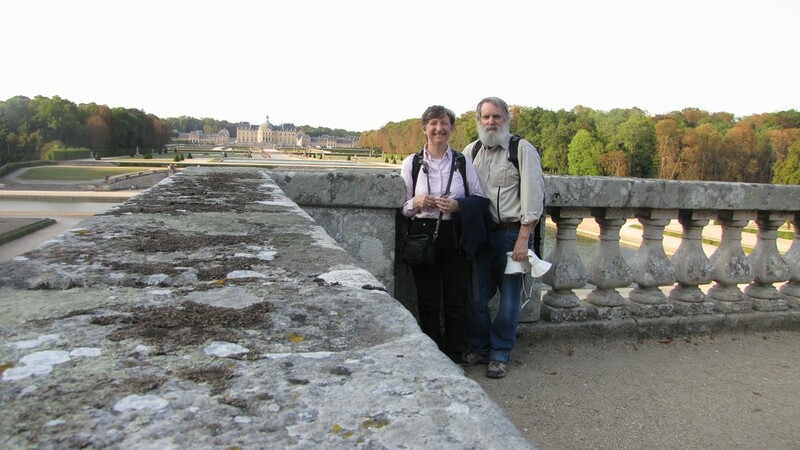 The next day we took the train to Melun, rather than biking as it was 50 km, looked a bit around the once-royal town, and then got ourselves to the Chateau of Vaux-Le- Vicomte. 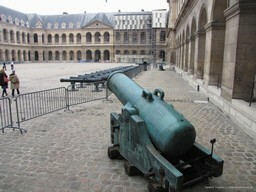 It was built by Nicolas Fouquet, Louis XIV's tax collector. Colbert (see above) schemed to convince Louis to confiscate it and put Fouquet in jail; that's what happened and Fouquet was locked up for the last 15 years of his life. In 2008 Gerry knew a bit of this history but wasn't exactly sure where the chateau was located; Jan had never been conscious of it until she read about it — the entire place — being rented for the wedding of NBA star Tony Parker and "Desperate Housewives" star Eva Longoria. Having seen pictures of it and the wedding we found out where it was and tried that year to go with friends but our plans fell through. As it turns out, Veronica has a small conection with Vaux: years ago when she was in the travel business the owners (Vaux is privately owned) came to her company and asked for help in promting the chateau. This year when Jan got a coupon for entertainment as a birthday gift (thanks again, all you Bates siblings) she was delighted to find there was an opera at Vaux that we could attend, so months in advance we bought our tickets. We had a great day seeing the chateau, a great afternoon picnic and walk in and gardens, and a great night seeing Rigoletto with the chateau as the backdrop. We did have some problems: When we got to Melun we found that the expected shuttle bus didn't run that day so we made our way by a combination of local bus and walking. After the performance with midnight approaching, we had the same sort of problem: how to get home with no shuttle bus? 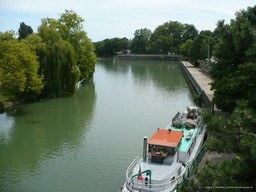 Jan threw caution to the wind and, as we stood at the entrance to the parking lot, asked each and every passerby-er for a ride to either Melun station or Paris. 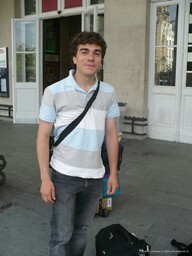 We were delighted when, waiting only a few minutes, we got a ride into central Paris with a young couple. We had a very nice conversation that lasted close to two hours because they got a bit lost. They were in a borrowed car and, after dropping it off, were going to bike home across Paris via Velib, the cheap city-run bicycle rental service. Only as our stay in Paris passed from being measured in days to being measured in months did we begin to overcome our museum exhaustion. After so many in Berlin and then a healthy dose bicycling in June we were museumed-out. That, coupled with the fact that we'd seen all the great and famous and most of the small but worthy meant that we'd rather stay at home with a book than revisit a known spot. 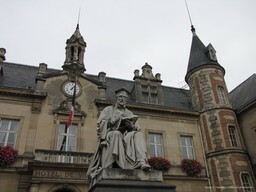 We did go to museums when they were connected with new places such as the chateaus mentioned above. Nonetheless, we did return to the Louvre for a day where we visited the Italian Paintings in the Denon wing and quite enjoyed our three hours there. On another Sunday we biked over to the Quai Branley Museum. Just months after it opened we'd been there; Jan, in particular, didn't like it, probably because it was so crowded and we tried to see too much. This time we visited just the Asian arts section, took our time, and there wasn't much of a crowd. Now Jan likes it quite a bit. We suppose it shouldn't be called a museum but it deserved to be: We visited the Aeronautic Laboratory founded by Gustave Eiffel. While building the Eiffel tower and various bridges he had to contend with wind effects. 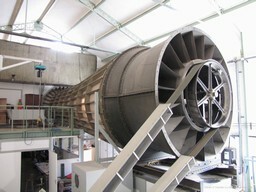 After getting rich from the Eiffel tower project he devoted himself to scientifically studying wind by building one of the world's first wind tunnels. We were lucky enough to learn about one of the rare open houses and even luckier to have as our guide the man who ran the place for most of the last fifty years. It's pretty much as Eiffel left it, except with some modern electronics. They still are active, having all sorts of customers. 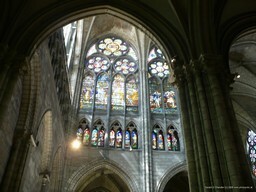 Outside of Paris St Denis we revisited the Basilica, which is more museum than church. Such a change from when we visited in 1999. Out in front the traffic is gone and there is a large square which houses a giant market on Sundays. Inside things are much more organized for the tourist and much more is open. All the statuary and gisants are very impressive. 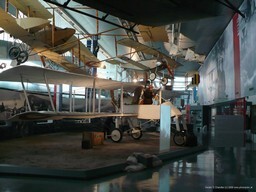 We went two times to the Air and Space Museum. There is far too much to be seen in a single day. Our first trip we learned all about the development of flight from prehistory to 1914; of course French contributions were emphasized with many early planes on display. Our second trip covered 1914-1939 and space flight. Here there was good coverage of Russian, American (particularly the moon landing) and French efforts. The highlight for Gerry was seeing the development of French nuclear missile technology. 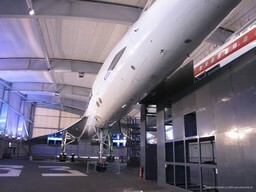 The highlight for Jan was touring the two Concordes on display; how crowded and non-luxurious they are inside! As September ended we had our only visitors; quite unlike 2008 when we had a month of them. With the Ellises we went to two more museums, both of these repeats for us: First we went to the Jacquemart-Andre museum and saw the special exhibit on the Bruckental collection of Flemish art. It was very good, but more like an appetizer than a full meal. The permanent collection is much larger and better. The next day we went with them around the corner to the Cernuschi museum of Asian art, a beloved of Gerry. On the weekends before and after the Ellis's visi we got out of town for the day: we took the TGV (train a grande vitesse) to Arras and on another day to Reims. 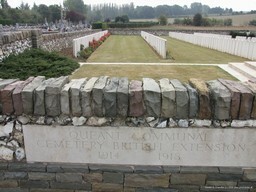 We went to Arras because it was near Queant, the small village where Gerry's Uncle Joe is buried. Joe volunteered to fight with the Canadian armed forces and died in September, 1918. In spite of no public transport we managed to get to and find the grave. On our return to Arras we still had a half day left; we enjoyed the sites by walking around and concluded our day with dinner in the Grand Place. 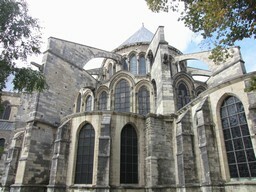 Reims is the city where, for nearly a thousand years, French kings were crowned in religious ceremonies. We'd been there in 1999 but were very rushed; this time we enjoyed a leisurely walk-about. We particularly liked the and the adjacent museum. 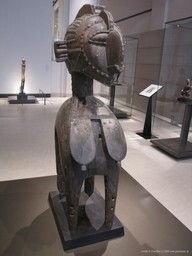 Unfortunately we chose a day to go when the Fine Arts museum was closed; it is said to have wonderful treasures. The first weekend in September, known in the US as Labor Day Weekend, is known in France as la Rentree — the Reentry or the Getting-Going-Again. With that seminars take off. Gerry went to one, a three day affair at the College de France, on Quantum Optics and Atomic Effects, where he sat through more than a dozen presentation on the advances in this area of physics in the last 30 years. There was much that he didn't understand but he quite enjoyed getting himself a bit up-to-date. Jan happily stayed home and read Dr Zhivago in Russian. 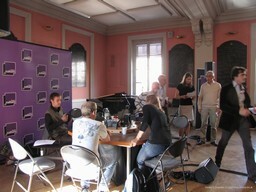 One morning we were either lying in bed or already at the breakfast table (probably the first but we have now forgotten) when we learned that the station to which we were listening, France Culture, would be broadcasting all day from the Ecole Normale Superieure (ENS; famed for many things, including that Raymond Aron and Jean Paul Sartre studied there). We quickly decided to go, rode over on the bikes, and had a very stimulating time: one broadcast hour was about developments in philosophy and another about advances in computer vision. That led to our later attending a three-hour session of a course at ENS on computer vision. The outing to the ENS was nearly the last thing we did in Paris. It was in the afternoon; that morning and the next day we cleaned and packed; packed and cleaned. Toward the end of the process, to Jan's astonishment, she came into the bedroom and found in place of a giant mess that had been there just an hour earlier, all of Gerry's stuff nicely put away. In other words, we weren't packing until the last minute. Or, if we are honest, we were: because Veronica came back two days before our departure and shared her flat with us. On the Thursday morning of her arrival, after a 22-hour overnight bus trip from Rome, we gave her a welcome breakfast and chatted and chatted. Then while she recuperated in bed we went off — to a museum. And on the last day in town, a Friday, Gerry dragged Jan off to another museum, this time the newly refurbished Army Museum. The best part for Jan was the steak for lunch at Le Vauban, a restaurant named after the famous fortress builder. The next day we were off. Having been in Paris only three months, rather than the nine in Berlin, it wasn't quite so unsettling to be giving back keys and taking off again. But it was with reluctance, if not tears, that we made our departure. Along a familiar path: down the street to the Bus 24 stop. Off to the Gare du Nord. Arrive in plenty of time and sit comfortably waiting for the call to board the Eurostar. And then in just two and a half hours we were in London and waiting for our friends to pick us up. Sometimes you get an offer you can't refuse. That's what it was like when our friends the Ellis's wanted to know if we would house-sit for them in September-October-November 2010. Their home is a comfortable place in the suburbs of Brussels. A new city is just what we wanted, so we immediately said yes. That left the question of the intervening months. What to do? For Jan it was already decided before the Ellis offer came up: Go to New Zealand. Two different friends had been to the South Island in the last year and both, Paloma and Wayne, talked about how wonderful it was. You can't miss it! We'd been to the North Island in 1983 but our two week stay was too short for us to want to rush to the South Island so we'd missed its marvels. As early as January we'd looked at Craigslist. In April we found what was a good candidate for a sublet but the owners wanted a tenant for August 1 - January 10, longer than we could stay. We expressed our interest and told them that we'd take it for November-January 10 if they couldn't get a tenant for the whole period. Finally in August they gave up waiting and offered their home to us. That's how we committed ourselves to Sumner, New Zealand for the mentioned period. We decided that afterwards we'd tour the South Island (maybe by bike) and then repeat some of the north Island, where a good friend lives. But what to do from say, April, to next September? Obviously we'd take an around-the-world ticket, but with what stops? South America was Gerry's first choice. But you really can't get there (cheaply) from New Zealand without flying all the way to the USA. And the seasons were just wrong: We'd be leaving New Zealand just as the southern Autumn ends and winter begins. That wasn't the best of times to be touring Chile and Argentina. South America will have to wait until another year. In the end — and we've got the tickets to prove it — we opted for a three month stop in Japan on our way back to England. Gerry's been there twice and Jan three times, the last with a two-month working stay in Tokyo. We've little idea what we'll do. Maybe we'll be lucky with Craigslist and maybe we'll spend a month in the south and a month in the far north. Back in Europe we're also wondering. Gerry hopes it will be a two month (July-August) bike trip from Warsaw to Riga. We're now half-way into our three weeks in England, seeing the folks and all that. Then its 29 hours from Heathrow to Christchurch, via Hong Kong and Auckland. May the weather gods be with us. An evil man force-fed his victim, like a Strasbourg goose, with lunch meats. The corner ruled it was a death by a thousand cold cuts.